Elorus enables you to create elaborate reports that help you get a complete picture of your financial activity for a given period and type of transaction. Reports in Elorus come in two formats; Summary and Detail Reports. You can choose from a wide array of reports in both formats so as to draw conclusions and make decisions regarding your business's financial performance. 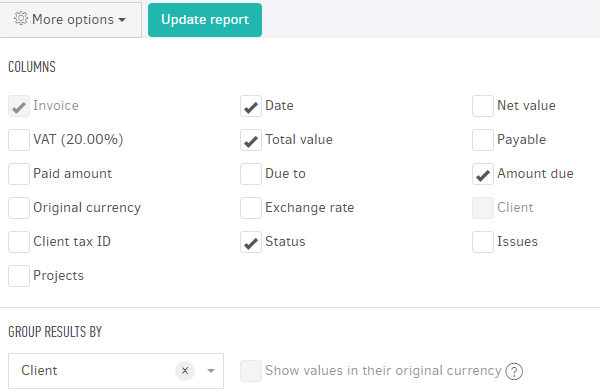 Note: In case you wish to obtain reports for transactions under multiple currencies, please visit our article. In Elorus, you can view reports for all kinds of records grouped by relevance, found inside Reports -> All reports menu. Summary reports are essentially charts which illustrate bulk statistical data and are ideal for obtaining quick performance insights. They are less "cluttered" with information compared to detail reports and are available in pie charts, bar charts and timelines. Here's an example of a summary report for Bills. Above the charts you can see four (4) indices informing you about the total value of purchases, their net value (without taxation that is), the initial value before discounts, and the total value in discount from your suppliers (if applicable). Next, you can see a timeline informing you about the distribution of purchases based on their date, so you can easily compare them. This is especially useful, when you need to know your expenses' fluctuation over time. 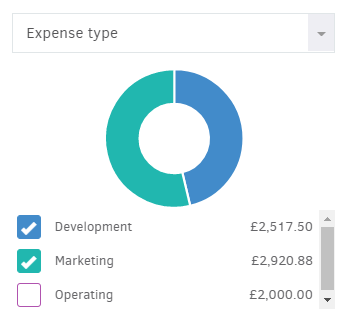 Next to the timeline, and if you have active tracking categories for purchase records, your can see a pie chart which shows you how much you spent on each option. Here, you can see how much a company spent on Developing, Marketing and Operating activities. > In case you have multiple tracking categories applying a type of records, you can view a different pie chart for each one, by clicking on the arrow next to it and choosing the desired one. 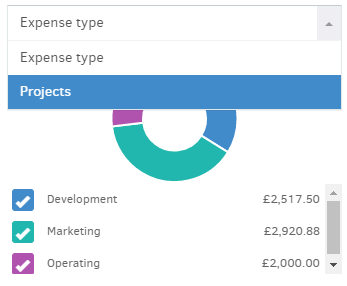 By clicking on each option's box the you can select/deselect in order to be included in the pie chart or not. This will enable you to compare ir expense types with each other in different combinations. At the bottom of the page you'll see two (2) more pie charts. The first one illustrates the amount in cash payments made and the amount which is overdue to your vendors. The second one shows the net value of purchases and the total amount owed per supplier. 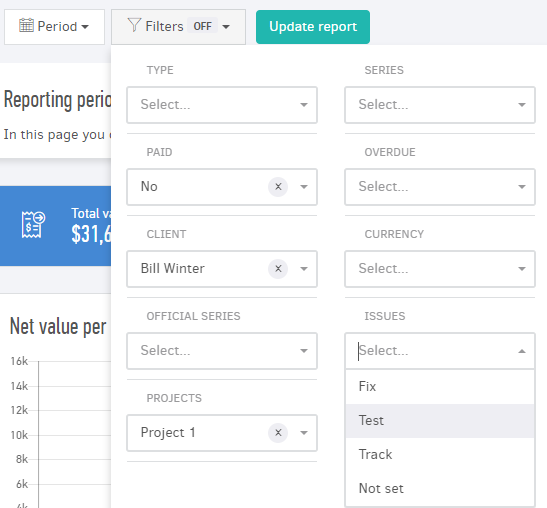 > Other types of reports such as the Cash flow report, have a timeline at the bottom of the page, instead of the above mentioned pie charts. Here's an example of a cash flow timeline. The three lines represent the cash balance, the total in cash receipts and the total in cash payments and how all of this is being recorded over the course of a year. This is useful to you, because you are able to figure out the "highs" and "lows" of your business's cash flow in order to have an estimation for next year and be prepared! You can display the results of summary reports per period and filter the data as desired by the relevant fields for more targeted information. 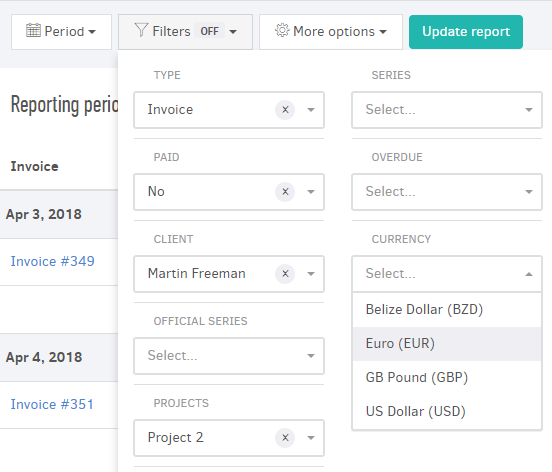 Ιf you have active tracking categories for the record types of the report, they appear in the Filters section to select an option (here, the payment account). These reports provide you with a more detailed picture of your finances and the results are completely customizable to match your needs. You can export them in Excel or PDF files maintaining their sorting, as well. Then, you can further process them and share them with your clients and/or partners. You can display the results table per year and filter the data as desired by the relevant fields for more targeted search. > If you have any active tracking categories applying to the report's type of records, you can see them inside Filters (here, Projects) so you can choose an option to view results. From the "More options" button you specify which columns you want to be displayed in the list by checking the relevant fields. Based on specific fields of records such as the date and the customer/supplier, you can group the data in the list. Also, if the list contains values, you can view subtotals for each group and at the bottom of the list, you get to see the totals. 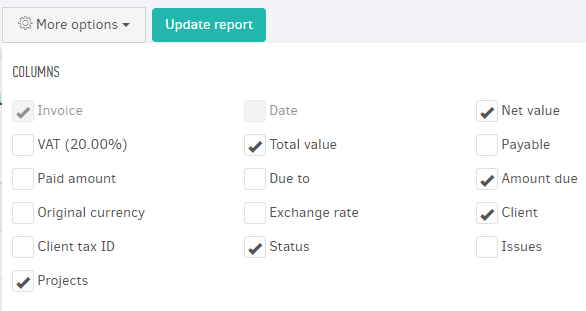 By clicking Update report the filters you entered are applied and the detailed report is ready. 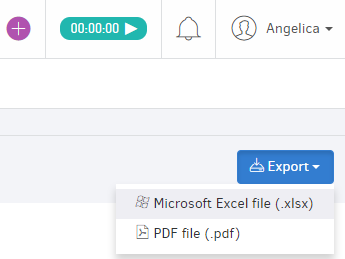 This option enables you to save tables to Excel or PDF files and send them, as a hard copy or via e-mail, to your clients and partners. Specifically, if you save a report to an Excel format you can edit or add/remove data before you share it with others. Most significantly, the saved files preserve the formatting, filtering and the exported file is identical to the one shown live inside Elorus. Suppose you want to see a report for the current year’s sales documents that have not been paid by the customer and their respective amounts. 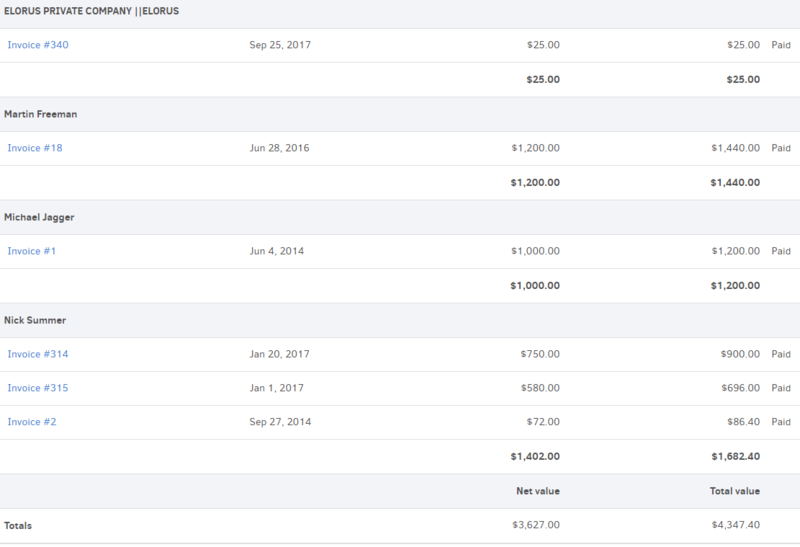 First, from the "All reports" menu select the "Invoices reports". 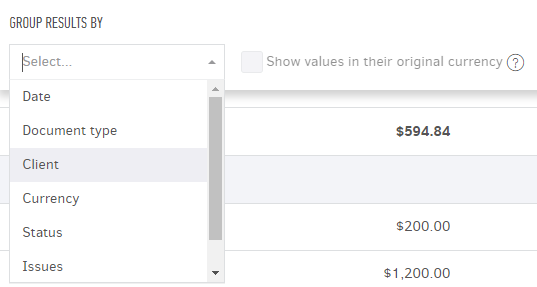 In the "Period" field select "This year"
In the "Group by" field select "Client"
In the picture below you will see that the "Invoice" and “Client” boxes are inactive. 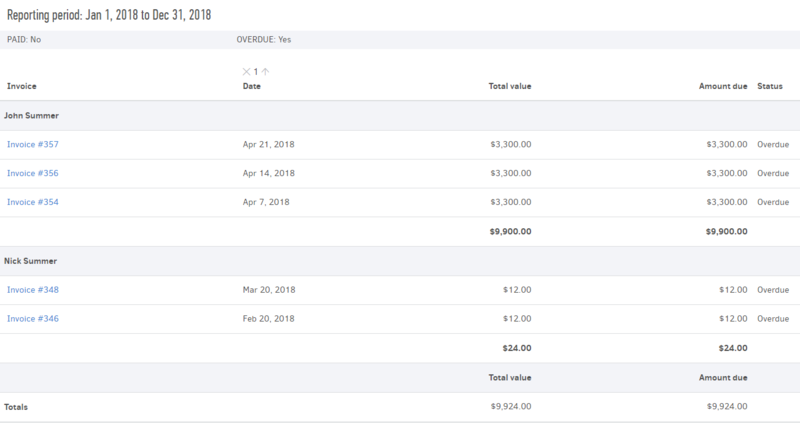 This happens because the list report involves invoices, so by definition, there will be a column by that name and because we grouped results by client, it is obvious that this column will appear in the table as well. The list created will be similar to the image below. As you can see, the data are grouped by customer and at end of each group (client), there is the subtotal of the group (the total amount each customer has not paid yet). Subtotals add up at the bottom of the list and provide you with an overall image the amounts due by your customers in retrospect to the total amount of invoices to which they relate. This way, you can spot how efficient your collection policy is and make the appropriate decisions.